Pete expands on the fifth quality of a church culture that deeply changes lives: passionate marriage and singleness. Christian marriage and singleness is different than secular marriage and singleness. Both have implications for multiplying disciples and building Christ-filled communities. It is possible to build a church, an organization, or a team by relying only on our gifts, talents, and experience. But Jesus says that our efforts are worth nothing unless they flow out of a relationship of loving union with him (John 15:5). 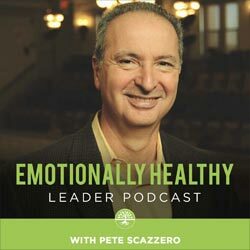 In this podcast, Pete shares an excerpt from the audio version of The Emotionally Healthy Leader where he talks about slowing down for loving union with Jesus. Staying in communion with Jesus is the most important leadership issue for each of us. Pete explores the sixth, and final, quality in this 6-part series on the marks of a church culture that deeply changes lives: every person in full-time ministry. After providing a broad theological overview of our calling and our work, Pete offers 5 specific applications for pastors/leaders to build a dynamic culture where people mature and are freed for God’s mission in their lives. In this 4th and final episode of a sermon series on the life of Jacob, Pete observes the life of Jacob in contrast to his son Joseph. One lived as if all things were against him. The other lived knowing God was for him even in difficult circumstances. How might you be living? In "Hard Lessons from the Life of Jacob: Part 3" Pete shares how Jacob finally faced his most difficult conflicts, became crippled in the process, but was changed by God.